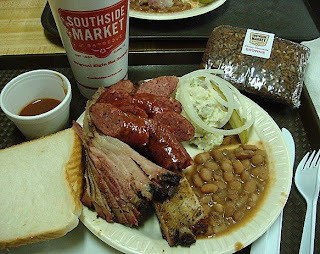 Yes, we're at it again, driving all over central Texas in search of great barbecue. This is the 4th year my buddy Scott and I have ventured forth on the quest for great Q and I suspect we will be doing it for a long time to come. It's a tough job, but we're up to the task. As usual, we tried to rent a big ol' cadillac with steer horns on the front for the tour, but got saddled with a crummy Jaguar, which I wouldn't wish on my worst enemy. We tried some new places and also went back to some of our favorites. 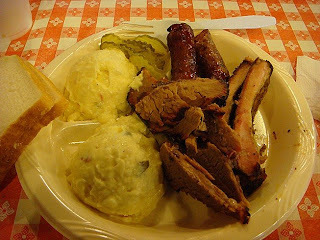 We reached "brisket nirvana" at one stop and threw away most of one meal, uneaten, at another. 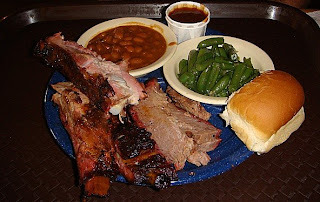 We visited Taylor, Elgin, Bastrop, Giddings, LaGrange, San Marcos, Lockhart, and Luling on this trip, which means we still have hundreds of joints to try in future years. 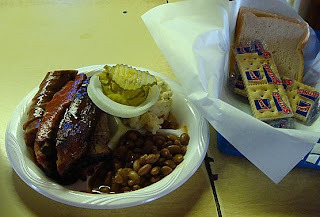 At most stops we sampled the "holy trinity" of BBQ, pork ribs, brisket, and sausage. 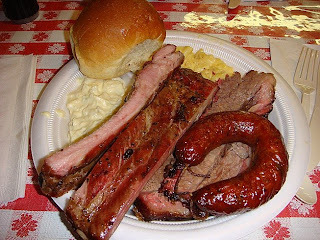 We are well aware that BBQ can vary greatly from visit to visit, or even from one end of a brisket to another. The opinions expressed below represent those for that particular day, at that particular time, and for that particular piece of meat. If we didn't like your favorite place, tough, you can just go eat vegetables for all we care. 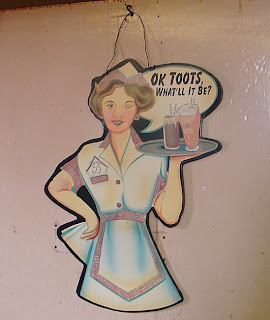 The photo above is from the door of the pit room at City Market at Giddings. I have no idea what it has to do with BBQ, but I liked it. 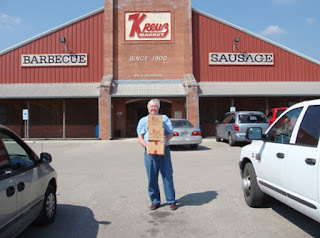 With a bad taste from Smitty's in our mouths, we headed to Kreuz knowing we had a better shot at something good. 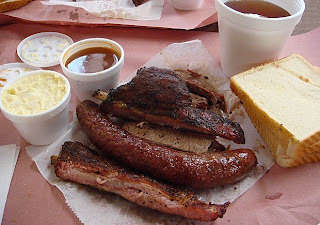 Originally, the plan had been to eat at Smitty's, then just stop at Kreuz for some sausage to go which I "needed" to take back home. 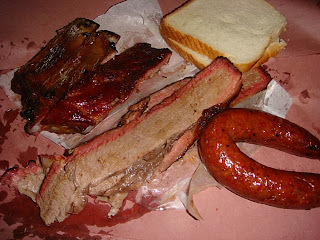 As it ended up, I got ribs, brisket, and a link, having plenty of room after our disappointment just down the street. Kreuz to the rescue! The ribs were falling off the bone tender and tasty as can be. They have a heavy pepper rub which sort of gives you just the one flavor, but they sure were a step up from what we tried to eat a few minutes earlier. The brisket was just a little chewy but with deep smoke flavor throughout. Good enough Scott ordered a pound to take back home to his fridge. The jalapeno cheese sausage ring was great, as always, and the friendly staff got my 3 cases ready as I finished my lunch. Unfortunately, their vacuum sealer was broken so we had to smell those great sausages all the way back to DFW. 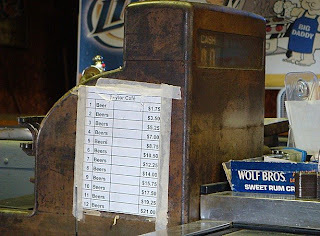 Smitty's is one of those places that keeps making everyone's "best" list, but I guess we just keep going on a bad day. This was our second trip there and most of it was literally inedible. The pork ribs were so tough they were like chewing shoe leather. The sausage had to be sawed with force to be penetrated and immediately presented a dinner plate-sized spot of grease. Not much flavor, either, and unchewable casing. The brisket was chewy with little flavor. We were there at 11:30 am on a Saturday so it wasn't like we were there on off hours or something. 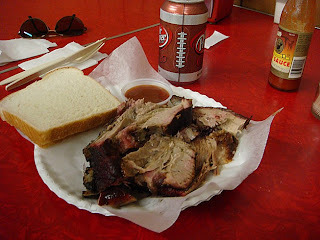 We threw most of it in the trash, uneaten, and headed to Kreuz Market. Another one of our "must" stops on the trip every year. The only disappointment this year was the pork ribs were just a a bit chewy. I'm sure the next rack would have been perfect, we just missed it. 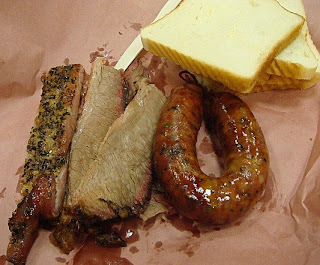 The jalapeno sausage ring I had was almost as good as kreuz market, but not quite. Awful good right off the fire, though. 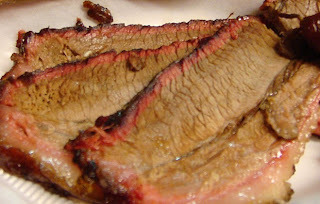 The brisket was top notch, as always, and required a separate photo for the beautiful smoke ring. 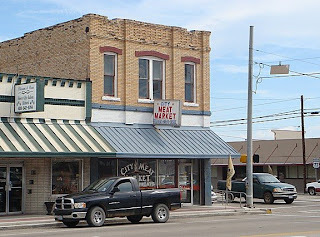 There are two places we NEVER miss on the tour, Black's in Lockhart and Luling City market in Luling. This is one of our standard "Best of" stops that we make every year and it was reviewed previously in this blog. Page down to see previous reviews and outside photos. Suffice to say that if I was grading on a scale of 100, brisket, sausage, and pork ribs would add up to a perfect bowling score. That's why we go back every year. If that wasn't enough, there was a sidewalk bake sale out front with a table full of home made cakes, pies, cookies, and brownies to raise money for some Luling charity. We bought 2 brownies, then had to go back and buy 2 more. Another big highway spot and, frankly, another disappointment. 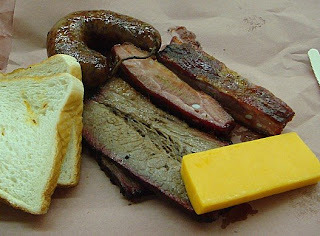 Their brisket was chewy with little smoke flavor and their sausage tasted all the world like eckrich from the grocery store. They had a sign advertising Lockhart sausage available, but I doubt the sausage I had, was. The ribs were a bit strange and Scott and I had the same experience. Their pork ribs were pretty large and were tender and tasty on one end, but practically un-chewable on the other. I don't know if they were cooked over an uneven grill or were stored in a warmer improperly, or what, One of the stranger BBQ encounters we have had. Their sauce tasted a lot like BBQ bean sauce and was heavy on the brown sugar. Yuck. 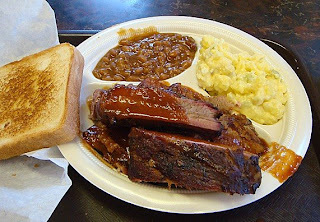 The sides at this place were very nice and they were very generous with them (a 3 meat plate gets 4 sides). Their potato salad and BBQ beans were top notch and Scott said his green beans were pretty good with a nice garlic flavor. 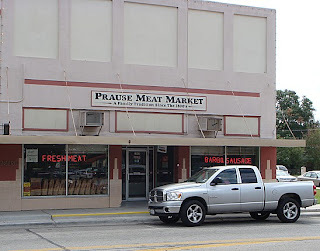 Another meat market specializing in BBQ and another stone winner on our tour. It's hard to believe how much food you can get here for just $9. All of it, exceptional! The brisket was plastic fork cutting tender with good smoke flavor throughout. The ribs were falling off the bone and tasty as can be. The sausage had a nice mix of spices, but without the extra jalapeno kick that I prefer. It had the perfect amount of moisture and the casing was a nice easy chew with the right snap. They don't seem to have iced tea here, everyone who asked for tea was handed a root beer. Little matter. They had a big block of cheese sitting next to a slicer and a chunk off that that made a nice addition to my lunch. Their sauce was sweet with some mustard flavoring. Something we have noticed at a lot of our stops this year. A find we made last year, we went back for the confirmation again this year. A call Tuesday night found they had sold out of brisket for the day so we put off our visit for Wednesday evening. On Wednesday, our rave-up from last year was confirmed. 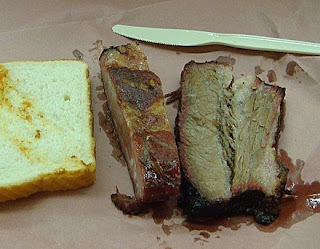 The brisket was excellent, smokey throughout, and plastic fork tender. 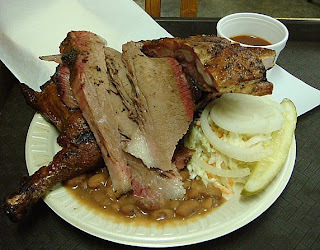 Equal in quality to any in Lockhart or Luling, which is as good as it gets in my book. The sausage was also excellent. A coarse grind, flavorful seasonings with just a hint of spiciness, and snappy casing that was not at all chewy. 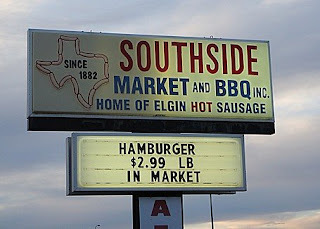 It reminded me a lot of the sausage we had earlier in the day at Giddings, with just a little extra kick. The ribs were flavorful, very smokey, but just a little bit chewy. Potato salad was mayo based, rich and creamy, and as good as I remembered from last year. Their sauce is sweet and tomatoe-y, but their meat is too good to mess with the sauce much, so I didn't. 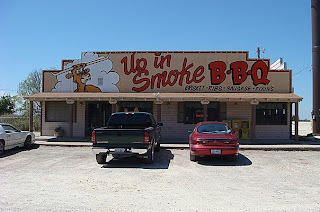 This place may not be on anyone's top BBQ joint list yet, but it will be. 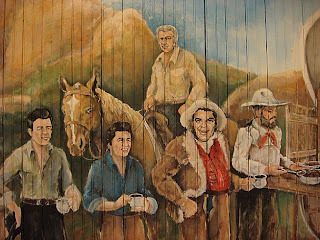 Photo is of a mural inside. Where is Hop Singh? 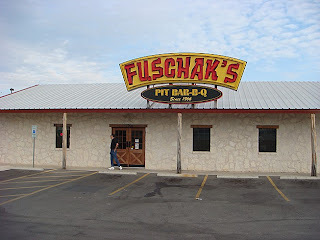 This is one of the places that makes all the top BBQ lists but this was our first chance to sample it. Their reputation is certainly well deserved. 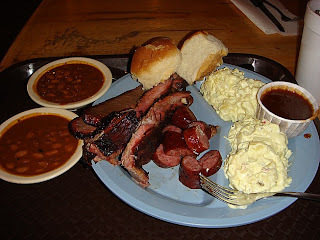 It has a super funky down-home atmosphere that gives you the extra oomph of a true Texas BBQ cultural experience. 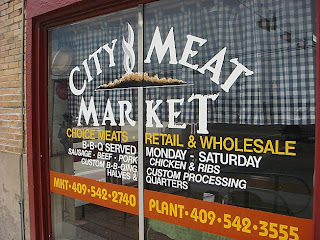 The pit room is at the back of the meat market but the smell of BBQ smoke smacks you in the face as soon as you walk in the door. They have the pits about 3 feet behind their cutting counter which is right in front of the customers in line, bringing you up close and personal with the feast you are about to have. The cutters and pit crew do a constant dance in that 3 foot space with slabs, racks, and poles full of sausage rings weaving in amongst the cutters grabbing fresh meat to cut as ordered. It is truly a sight to see. 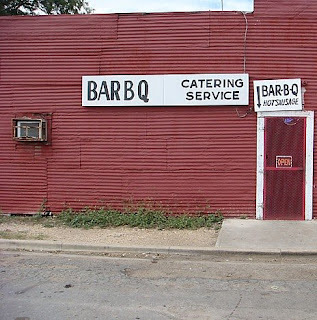 I'm sure more than a few BBQ trainwrecks have occurred in that tight space. 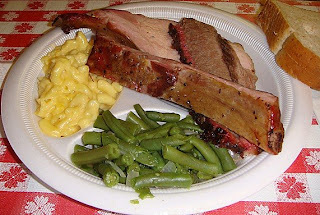 The ribs were tender and tasty with a nice crusty peppery outer skin. Nice flavor throughout and chin-dripping juicy. The sausage was also very nice. Coarse ground with absolute perfect moisture content and a tasty mix of spices without much kick. I generally like my sausage a little hotter than theirs, but other than that, it was about as good as it gets. Nice snappy casing, too. The brisket was just a tad on the chewey side and didn't seem to have a lot of smoke flavor. It was the only item that landed on the average side. The potato salad was mayo based with a hint of mustard and was quite good. 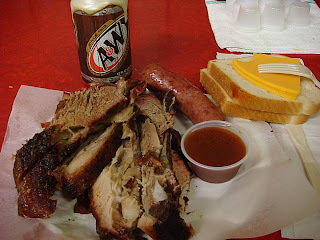 Their sauce was an interesting mix, less mustard than Luling, but more mustard than most. Sort of as if you mixed Luling mustard sauce with average sweet tomato sauce. It did help the brisket out this trip. The dining area is a tight little space and helps to add to the cultural experience. On one side of us were what seemed to be city officials, gnawing on ribs and discussing how to fix some problems at the city library. On the other side, a couple of DPS State Troopers discussing shift changes and traffic stops. Well we are 0 for 3 in Elgin. Despite it's lofty reputation, like the other 2 spots in Elgin we have tried, this place did not impress. 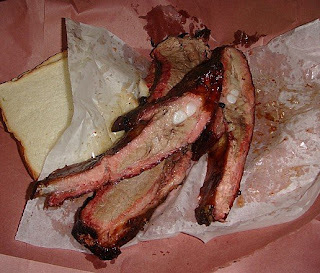 The ribs were chewy and not particularly flavorful and the same could be said of the brisket. The sausage was dry and very average with a chewy casing. Sides were also average. 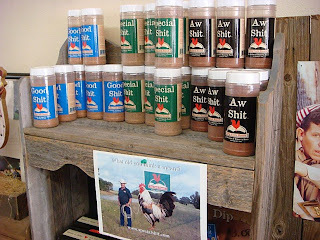 Their sauce is different from any we have tried with a flavor that is hard to describe. It really doesn't taste like any BBQ sauce I have had before. If I had to guess I would say chili powder and some other spices I didn't recognize. It wasn't evil, but it didn't really help the meat either. We still have one more place in Elgin to try, but we're in no hurry to get back that way. 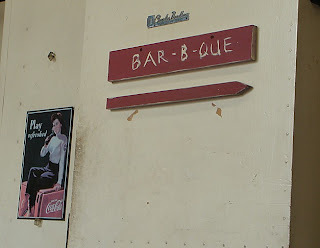 We had visited Vencil Mares' place a couple of years back and enjoyed it, so we decided when Up in Smoke did not satisfy us for lunch we would stop off in Taylor for a top-off. Mr. Mares was not in his usual spot but we were there a little late in the afternoon when most of the customers were there for beer-thirty, not BBQ. Scott and I decided to to split a single 3 meat combo plate and the server was nice enough to bring us an extra plate for the division. She also brought us a pitcher of tea, which I'm always happy to see. Unfortunately, when she asked if we wanted regular and spicy sauce I forgot to say "on the side" so everything came doused. That was not a bad thing, as he has a nice spicy tomato sauce, but that sort of messes up the comparisons with other places as the sauce will cover up some of the flavor in the meat. Everything we had was nice, but especially the brisket. Super tender, smoky, and melt in your mouth good. The ribs were tender and tasty with good smoke flavor. We opted for the turkey sausage, which we had sampled before, and it was still mighty fine. Sides were average. This place also has a great down-home atmosphere. 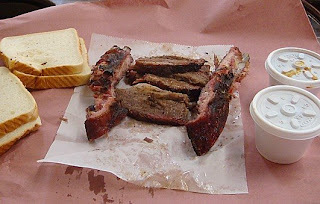 On a whim, and because I wanted to sample some un-doused, I got an extra half a pound of brisket to go and sampled it in the car before we pulled out. The reaction was, as Scott described it, "brisket nirvana". 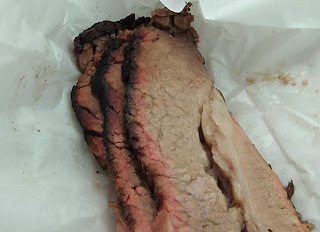 Some of the best smoked brisket either of us have ever had, anywhere. When I went to pinch off a little piece of fat, it just melted away between my fingers. The smoke rind on the outside penetrated a good 1/4 of an inch with 3 distinct colors. The smoke flavor was so deep that it stayed with you for minutes after you swallowed. I knew it had been good on the combo plate, but only after eating it un-sauced out of a paper wrapper did we get the full force. 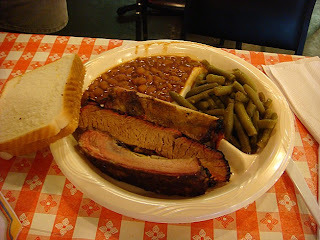 Just our second stop on a 5 day tour and we had already reached "brisket nirvana". How are we going to top that? Thank you Taylor Cafe!! 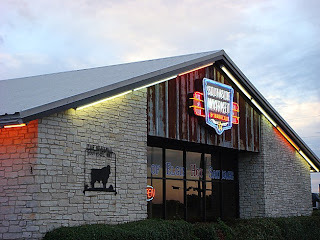 We've been driving past the many signs for this joint for years on I-35 and thought, for once, we would stop and check them out on the way to the true BBQ grounds down south. I've always liked the worried look on the steer's face. Being cautious types, and knowing there was great Q just a few miles further down the road, we opted to split a single 3 meat combo plate to try it out. It was pretty much average Texas BBQ without a lot of smoke flavor, a little chewy, and helped along by an average sweet and spicy tomato sauce. It's a good average joint, but we won't need to stop again.